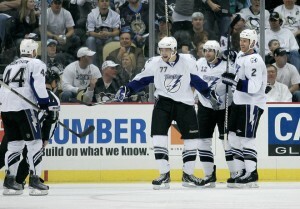 Dan Scifo takes us through what he saw during last night’s Pens/Lightning Game 2. The Lightning took the game 5-1, evening the best of seven series at 1-1. PITTSBURGH — The Tampa Bay Lightning couldn’t get anything past Pittsburgh Penguins’ goaltender Marc-Andre Fleury and a rock-solid defense in Game 1 of their Eastern Conference Quarterfinal series. But that all changed two minutes into Game 2. Tampa Bay, after failing to find the back of the net in Game 1, scored three first-period goals, including two in the first 6:53 as the Lightning evened their best-of-seven series against the Penguins with a 5-1 victory in Game 2 Friday night at the Consol Energy Center in Pittsburgh. The series shifts to Tampa Bay for Games 3 and 4 Monday and Wednesday before returning to Pittsburgh for Game 5 on Saturday. The Penguins broke down on Friday after a stellar defensive effort in Game 1 as Tampa Bay scored a pair of power play goals and two more on two-on-one rushes. The Lightning voiced their displeasure after receiving one power play opportunity in Game 1, but Tampa Bay’s sixth-ranked power play unit made an impact Friday. The Lightning went 2-for-5 with the man advantage as Vincent Lecavalier and forward Martin St. Louis, who underwent a double root canal following Game 1 after taking an errant stick to the face, scored crucial power play goals. “They have a good power play over there,” said Penguins’ forward Aaron Asham. “We definitely have to stay out of the box. It was the first goal, that might have been the biggest, especially considering Tampa Bay couldn’t get anything behind Fleury, who made 32 saves in Game 1, but stopped just 16 of 20 shots on Friday. His counterpart, Dwayne Roloson made 35 saves for the victory. Tampa Bay scored two goals on its first three shots as defenseman Eric Brewer, skating on a two-on-one, staked the Lightning to a 1-0 lead 2:02 into the game when he sent a short-side wrist shot over Fleury’s glove hand. Lecavalier made it 2-0 with a power-play goal at 6:53 after the Tampa Bay captain one-timed a pass from Simon Gagne behind Fleury. The Lightning, who finished second in the Eastern Conference with 247 goals, added a third first-period tally as Steve Downie forced Penguins’ defenseman Paul Martin to turn the puck over at center ice, creating another two-on-one. Downie’s shot from the right-wing circle ricocheted off Fleury’s blocker and right to the stick of Nate Thompson, who buried the rebound for his first career playoff goal. The Penguins had their chances to close the gap, with five power plays opportunities through two periods, but they could barely gain the blueline let alone set up in the offensive zone and generate shots. The lack of structure drew jeers from the 18,507 in attendance – the largest crowd in Consol Energy Center history. Craig Adams got the crowd back into it with his goal midway through the second period. Asham forced Roloson into a mistake behind the net before setting up Adams in front of the net for his first of the playoffs. The Penguins dictated the play from there, dominating at times as they consistently buzzed around the net and put shots on Roloson while the crowd gasped at each near scoring opportunity. But St. Louis took the life out of the building six seconds after Orpik was sent off for holding. St. Louis, somehow found the back of the net and made it 4-1 after he threw the puck at Fleury’s equipment along the goal line. “That one 20 seconds before the end of the period killed us,” Michalek said. From there, Tampa Bay clamped down using its 1-3-1 to limit the Penguins’ scoring chances in the third. Mattias Ohlund added an empty-netter to cap the scoring and send the series to Tampa tied at one game apiece. “We know we have a good team,” Asham said. “We know we have to go there and steal a win and hopefully take two. ***In addition to his work here at From the Point, Dan Scifo is the Assistant Sports Editor of the Latrobe Bulletin.